I was surprised and delighted by the photograph below, prominently displayed in this week’s Irish Times magazine. In the accompanying article, journalist Arminta Wallace makes the point that the central figure in the photo is recognizable anywhere in the world, and challenges the reader to name the two Irish scientists flanking him (they are identified later in the piece). 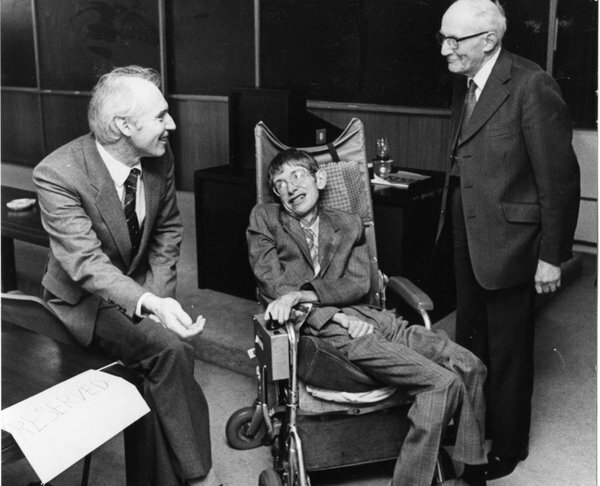 The scientist on Hawking’s right is the Irish physicist Ernest Walton, famous for splitting the atomic nucleus in 1932. The Cockroft-Walton experiment was the first successful accelerator experiment (and the first demonstration of E = mc2) and led to a well-deserved Nobel prize. As the prototype of all ‘atom-smashing’ experiments, Walton’s work is extremely relevant to this week’s discovery of the Higgs boson at the Large Hadron Collider (LHC). What would the trio have discussed? What do a leading particle theorist, a cosmologist and a Nobel experimentalist talk about over coffee? My guess is the newly-minted theory of cosmic inflation might have come up. Inflation is a theory that concerns the behaviour of the entire universe in the first fraction of a second, but it borrows heavily from ideas in particle physics. Hence it represents a convergence of cosmology ( the study of the universe at large) with particle physics (the study of the world of the extremely small). Given that the theory had only recently been posited, it’s highly likely that it was discussed by the trio with some excitement. (Of course Walton was an experimentalist but he had a lifelong interest in theory; it is often forgotten that he had a first class degree in mathematics as well as physics and he attended many conferences at the Institute over the years). Ms Wallace draws a nice connection between the photo and the upcoming Dublin City of Science Festival. There is also a connection with science’s latest triumph, the discovery of a Higgs-like particle. First, Walton’s pioneering accelerator work laid the foundations for today’s experiments at the LHC (see above). Second, Lochlainn made several important contributions to a theory now known as ‘supersymmetry’. Supersymmetry is currently being put to the test at the LHC, as experimenters search for the ‘supersymmetric’ particles predicted by the theory. Thus the work of both Irish physicists remains relevant today. You can read the Irish Times article here and more on Lochlainn’s work here. By coincidence, Lochlainn’s work will be celebrated at an international conference on theoretical physics in Munich next week. How about Higgs particle instead of Higgs boson? 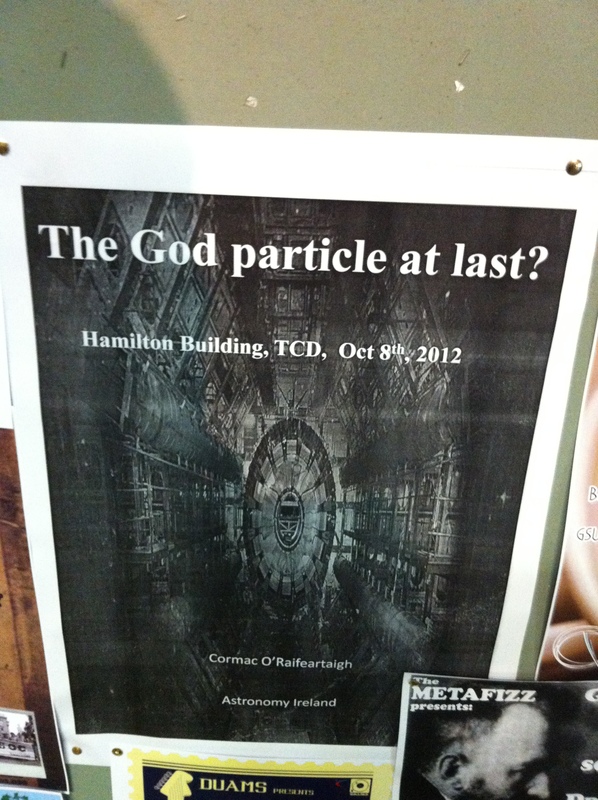 Like so many of us physicists, Micheal has a problem with the name ‘God particle’. Scientists have a healthy dislike of hubris (not to mention the needless antagonizing of religious-minded folk) and I am inclined to agree with a ‘do-er’, e.g. a researcher from CMS. Happy Higgs day Micheal, you and yours have done us proud! 2. There is also the problem of priority; as every physicist knows, Professor Higgs was not the only theorist involved in the development of what is now known as the Higgs field (and he predicted the field, not the particle, as he often points out). Many theorists played a part in developing the theory, something that will create something of a Nobel headache – the name won’t help! 4. Could it that the hubris, which we physicists find so annoying, is exactly what it takes to get the public interested? Perhaps science journalists know more than we give them credit for. Finally, there is the problem of religion/theology. Granted, there are some amongst the devout who take grave offence. Actually, I have never heard a serious theologian criticize or applaud the moniker – they understand the concept of a nickname. Those who can’t see past this may not be worth appeasing. One obvious comparison here is the nickname ‘big bang’. However, cosmologists hate this moniker for a different reason;it is technically misleading because the theory says nothing about a bang (the name was originally coined by Hoyle as reductio ad absurdum). Yet the expression has been enormously useful at getting across a crude version of the theory. I would much prefer the expression ‘ evolving universe’, but I wonder would the theory have captured the imagination of the public to the same extent. Truth is, I suppose we’ll never know…in the meantime, I think I’ll compromise with ‘Higgs particle’ if I’m interviewed tomorrow! 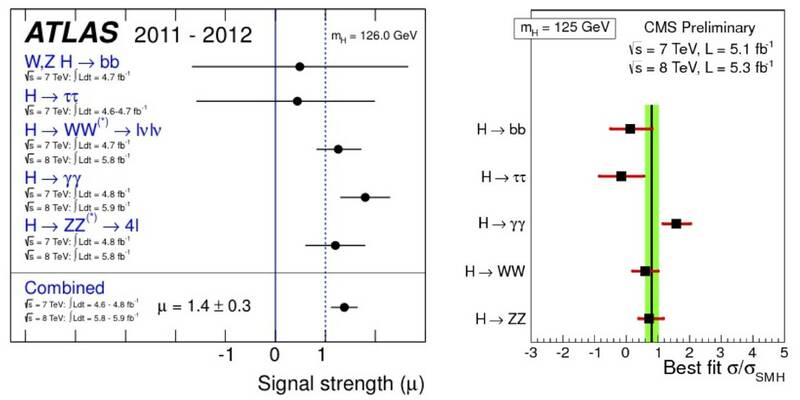 So the big news: the first proton beam got all the way around the LHC ring this morning without mishap. Cue much celebration in the CERN control room and around the particle physics community. For more live postings describing the day’s events, see the list on the international particle physics website interactions.org , it’s almost as good as being there. P.S. No earth-eating black hole so far…surprise surprise. Update: a second success… a proton beam successfully completed the loop in the opposite direction in the afternoon, this is way ahead of schedule. The world is not going to end tomorrow (September 10th) and the LHC startup does not constitute a danger to the public, contrary to claims by one or two scientists (non-physicists) that have been widely reported in the media (see here and here for example). Instead, tomorrow marks the beginning of an exciting new era in particle physics – the start of experiments at the world’s most powerful particle accelerator, the Large Hadron Collider at CERN. Below is part of an article on the LHC that I wrote for an Irish newspaper (they may not use it, thanks to a large number of articles on the same topic by people who know little about the subject). The two main points I wanted to highlight were the safety of the experiment, and the fact that Ireland, almost uniquely among EU nations, is not a member of CERN – despite the fact that our only Nobel prize in science is in precisely this area. September 2008 marks an important month for European science. This month, measurements begin at the new “atom-smasher” at CERN, the European Organization for Nuclear Research. Long the jewel in the crown of European science, CERN truly becomes the NASA of the sub-atomic world with the opening of its Large Hadron Collider (LHC), the world’s newest and most powerful particle accelerator. 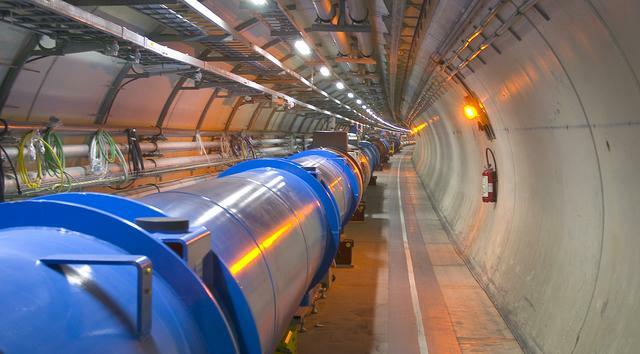 Situated in a vast 27 km-long tunnel deep beneath the Franco-Swiss border, the new machine at CERN is probably the largest scientific experiment on planet earth. The experiments at the facility will be watched with intense interest by scientists the world over for information on the fundamental structure of matter, and on the evolution of the early universe. How does it work? Beams of the smallest particles of matter travelling almost at the speed of light will be smashed together in head-on collision. 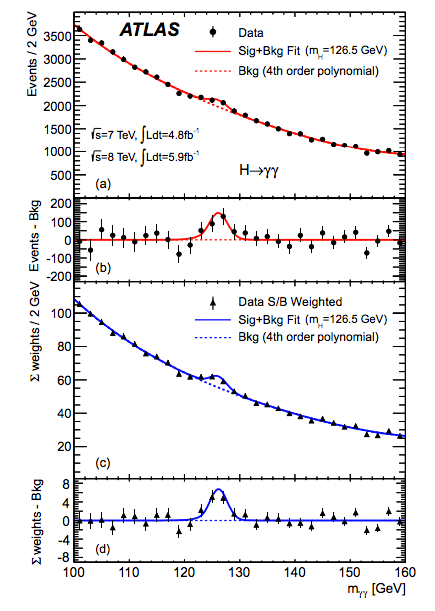 Out of the intense energy of collision, exotic short-lived elementary constituents of matter not seen since the Big Bang will be fleetingly created and tracked in giant particle detectors. Such experiments offer not only a glimpse of the deep structure of matter, but also of the nature of the forces that hold it together. For example, evidence of the existence of the elusive Higgs boson or ‘God particle’ could offer support for the so-called Standard Model of particle physics, confirming that our view of the origin of mass is correct. Glimpses of exotic entities such as ‘supersymmetric’ particles could reveal deep connections between all the fundamental forces of nature. Other experiments might reveal the true nature of space and time. Cosmologists hope that the experiments at CERN might offer insight into the formation of the early universe, as the giant collider will achieve energies not seen since the Big Bang. In particular, a glimpse of certain particles could shed light on the nature of Dark Matter, one of the great puzzles of the universe at large. Is the LHC safe? This question has recently received much attention in the world’s media. In fact, the accelerator is simply a more powerful version of previous machines and constitutes no danger to the public. 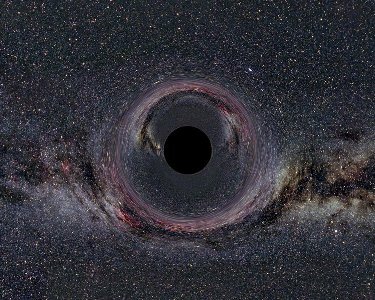 Rumours that it could create a giant earth-eating black hole arise from a misunderstanding of the physics of black holes (although there is an intriguing possibility that harmless mini-black holes could be created in the experiment). Such research into the realm of the sub-atomic might seem of dubious practical application in today’s world. However, the technical spin-offs of experiments at facilities such as CERN are legendary. In 1990, the world wide web was created by CERN physicist Tim Berners-Lee in order to provide a platform for scientists to share and analyse experimental data. Accelerator technology developed at CERN is now routinely used in important medical applications. Most recently, CERN scientists have pioneered the use of GRID computing, a new type of computing that involves the networking of thousands of computers, in order to facilitate the analysis of vast amounts of data that will be collected at the LHC. CERN is regularly cited as an outstanding example of European collaboration. Created in the 1950s to counter the brain-drain of European scientists to the U.S., it now provides a world-class facility for the scientists of over 20 European nations, while a host of non-European nations such as China Japan, India, the U.S. and Russia all enjoy associate membership. 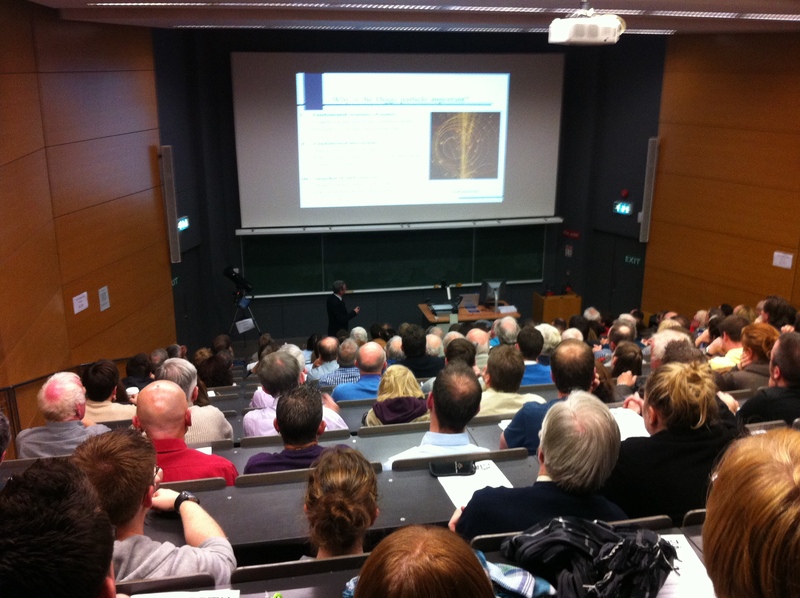 In fact, there are more American particle physicists working at CERN today than in the U.S.
Europe has reason to be proud, but Ireland has not. The participation of Irish scientists in the historic experiments will be severely limited by the fact that the Republic, almost uniquely among EU nations, is not a member of CERN. This omission has decimated Irish research in experimental particle physics, one of the most fundamental fields of the sciences (with the honourable exception of one group at UCD). It has also rendered it almost impossible for Irish engineers and scientists to bid for the large international contracts in high-tech software and hardware projects, a fact that sits awkwardly with our efforts to become a world leader in science and technology. Strangest of all, Ireland has a proud tradition in this field of science. In 1932, the Irish scientist Ernest Walton and his Cambridge colleague John Cockcroft built the world’s first particle accelerator and used it to split the atomic nucleus, an achievement for which they were awarded the Nobel prize. This work opened up the field of sub-atomic physics, and a version of their machine is used today as a preliminary accelerator in the new facility at CERN.